Discussion in 'Politics, Religion, Social Issues' started by steve knight, Aug 5, 2014. Yes we need more hate and stupid laws based on some screwed up interpretation of the bible. Not surprising at all. Living in Louisiana, this is how the majority of southerners think. There is no Republican party anymore. It's now the Bible party. Look at the Republican Party of Texas' platform. It's essentially Little House on the Prairie meets the Southern Baptist Convention. By Bible party, I mean they pick and choose a few scriptures and build a platform of hate and denial off of those passages. I am a Christian. However, I despise the modern day church and the Christian right which in no way resembles the true teachings of the Bible or Jesus. If a single cent of taxpayer money went to buy and mail these bibles. That guy needs put in prison for 20 years. I also live in Louisiana and it wasn't so bad when the governor was from Louisiana (Edwin Edwards forever!! ). But now the asshat we have as governor has decided to turn Louisiana into a copy of Texas, Arkansas, and Mississippi. We're losing our very unique culture. I would be OK with it if he had sent out copies of the Constitution. Maybe they could read the First and Fourteenth Amendments. It says in a letter that they were provided by a citizen. Why those amendments specifically? I would hope they all read the whole thing cover to cover. Can you clarify? Your current governor was born in your state. But lets hope most of these bibles were thrown in the trash. Do you? I see a congressional letterhead, for a letter printed on paper paid for by the government, distributed by staffers who ... you get the idea. In keeping with Jesus H., he should not get twenty years, he should get 33 years. Why? There's lots of good stuff in there. Don't get too jaded by how some like to try and interpret it. There is lots of good stuff in War of the Worlds, and Plato's Republic and Principia Mathematica and Being and Nothingness, what makes the bible somehow more special and useful than any of these? The only stuff that's "good" in there is essentially common sense, and is found in religious texts all over the world. Nothing good in religion is unique, and nothing unique in religion is good. We can agree to disagree I suppose. Well, if he passed around copies of the Jefferson Bible, that might be noteworthy. You say liberals like it is an insult. Furthermore this thread is about some stupid asshat deciding that everyone should read the book of hatred(or misinterpret it that way) NOT the death penalty. We believe in making bad people suffer. What you speak of is over much too quickly. Religion is the biggest cancer to the human race and should be eradicated at all costs. Lawmakers should not be using fairy tale books or beliefs whatsoever to make public policy. If they try to, they should automatically be removed from office as they're clearly breaking their oath to uphold the Constitution and separation of church and state. The only " good stuff " in the Bible is common sense found in texts all over the world. I would be upset if one cent of my tax dollars went to promote that fairytale. The majority of problems in the world are caused be religion. The less of it, the better. I don't recall anyone trying to establish a national religion. Whew, I thought for a moment we were gonna once again hear about that whack-job, right out of an in-bred rural area horror flick, Ted Cruz. But then the caffeine came to my senses and I realized that Cruz is a Senator, not a House member. Thank goodness for the little things in life that matter. While I'm not a Christian, I don't see anything wrong with what he did. 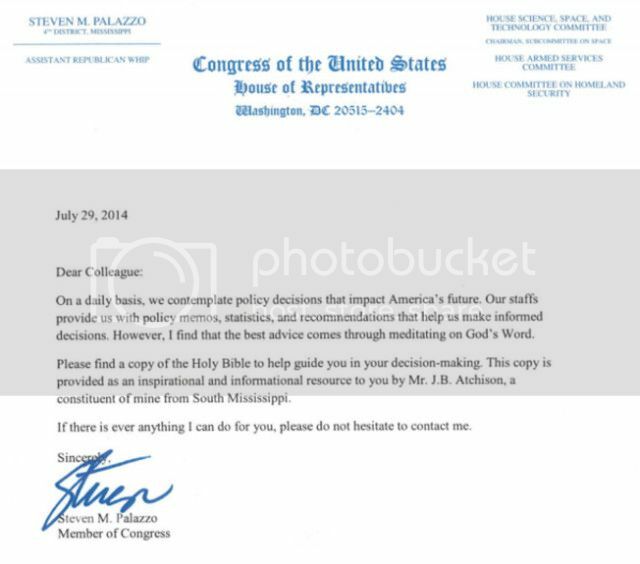 The truth is the majority of the Congressmen/women are Christians, on both sides of the aisle. His message is very simple. No one is forced to use it. If someone wanted to send a Quran, Book of Mormon or a book on meditation, I'd be equally okay with it. The books were paid for by a third party. My favorite part is the line at the bottom; "If there is every anything that I can do for you, please do not hesitate to call me.". This is a young, freshman House Member reaching out to introduce himself to his colleagues. I think that it's been hyped up a bit by the media. I'd actually like to see more members go out of their way to reach out to all of their colleagues. Religion: responsible for more deaths worldwide than all crime, disease, natural disasters, drugs, and freak occurrences combined. I guess that moronic minority whip who penned that idiotic letter never heard the phrase "separation of church and state".